Actor and comedian Bernie Mac (born Bernard Jeffrey McCullough) has died at the age of 50. He reportedly passed away early today at a Chicago area hospital of complications due to pneumonia. 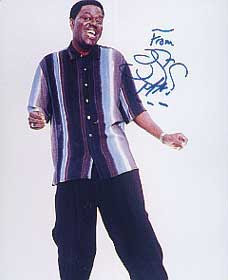 Mac suffered from sarcoidosis, an inflammatory lung disease, but he had said the condition went into remission in 2005. He received accolades for his Fox TV series "The Bernie Mac Show," which aired from 2001 to 2006. He also had starring roles in several blockbusters on the big screen, including "Ocean's Eleven," "Bad Santa," "Charlie's Angels: Full Throttle" and "Transformers."